"" Writer's Wanderings: Have You Seen The Green Flash? Sunsets are a beautiful ending to the day when the sky isn't overcast and rainy. The colors can be absolutely spectacular and no two sunsets are ever alike. Sometimes the most dramatic part of the sunset happens after the sun has actually gone below the horizon. Pinks, oranges, yellows light up the clouds and then they turn to soft shades of purples and blues. 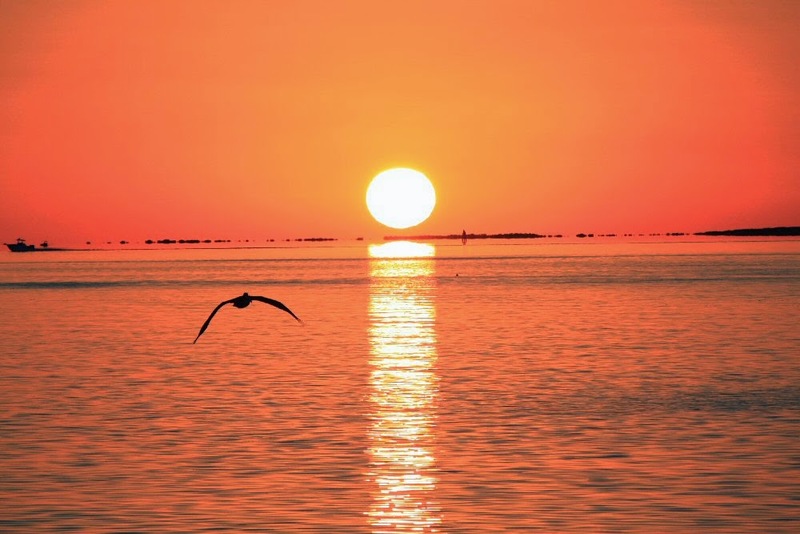 We've always enjoyed watching the sun set and especially when we spend time in the Florida Keys. People there take the time to sit and watch the glorious changes that take place. The most anticipated event however when watching the sun set over the water is the green flash. For a long time I thought it was a myth. A way for my husband and sons to trick me into believing that there was such a thing. And then I saw it! We were on our way back to our cruise ship from a diving excursion and the sun was setting. (Yup, the ship was waiting for our return because it was one of their excursions.) As we cruised along toward the ship the sun took its final dip and I saw a spot of green. Now, we'd been watching it for a time so I figured that it was just my eyes playing tricks since I'd been staring at the sun. I finally did some research and yes, there is a phenomena called the green flash. You have to have an unobstructed view of the sunset to see it and no clouds on the horizon. It all has to do with how the light is refracted through the earth's atmosphere and the colors that are blocked as the sun nears the horizon. You can read about the green flash at Universe Today. They have some great pictures. I haven't been able to capture it yet but not for lack of trying. Bottom line: Yes, the green flash exists! It's one more dynamic to all those beautiful sunsets.